Syed Anwaarullah – Debugging Life, Simulating Experiences, Looping Output! I’m glad to introduce our first Smart Consumer Product, the Smart Prayer Times Display & Azan Clock through our Startup AlAleem Systems. 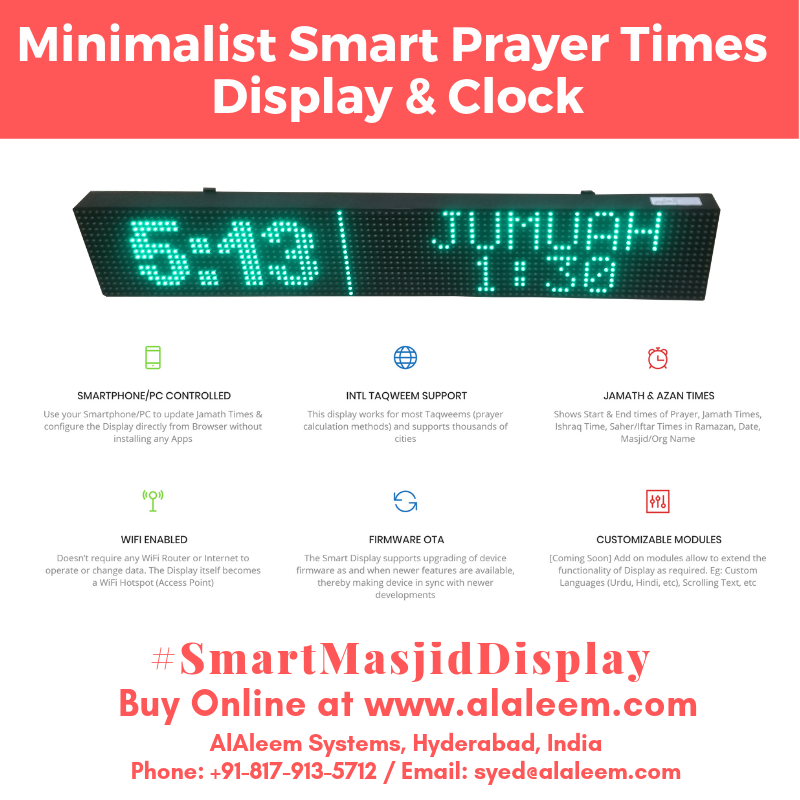 This is a first of it’s kind Smart WiFi Enabled IoT Prayer Times Display & Azan Clock for use in Masjids, Islamic Centers, Schools, Offices, Industries & Homes. Please visit us at https://alaleem.com for more product details and to place an Order Online. Thank you for taking the time and effort to review this Project and provide your feedback and insights. You can skip the Background section below and jump to the main content. JazakaAllahu Khairan for your efforts. This post will walk you through the 3 methods of SSHing into the C.H.I.P without using any external Display Screen. This is helpful if you don’t have the HDMI/VGA add on modules for the CHIP or don’t have an old TV that takes in those oldie RCA composite video signals. Once done, now figure out how to get started with it. It’s easier if we have the HDMI/VGA add-on module for the CHIP that’ll allow us to simply hook up the CHIP to a display unit and get started with a K/B & Mouse. I didn’t buy one, so I’m now worrying how do I get started with. Turns out, the CHIP and the PC can be directly connected to each other through a simple Micro USB Cable and tinkered with. One of the most amazing features of CHIP is that it’s insanely simple to use it as small, wireless computer. Low power requirements, battery-powered with charge management, and both WiFi and Bluetooth connectivity makes CHIP easy to run as a headless, autonomous machine. Of course, you’ll still want to access it and control it without a monitor or keyboard. You can control CHIP with another computer and a serial or network connection. Here’s how you do this. OK, all the info for getting started with any of the 3 methods is there in the link above. Why do we even need this post? Except… Method 1 won’t work on my PC! Use a USB-Serial Console/Debug cable, hook it up and SSH. Now, while you’re inside, you can go and setup the CHIP to connect to your WiFi network so that you can SSH into it. All good! End of Story! Nope, Method 1 (USB – PC) didn’t work, so let’s make it work! I found an excellent tip by lordhex on the community forums here: https://bbs.nextthing.co/t/putty-connection-step-by-step-for-windows/1636/11 and I did just that to get this method working. I made the CHIP install itself against this driver, and boy, it finally showed up as a COM port! Make sure you have disabled the Driver Install from Unknown Sources restriction on Windows 10 (to do this, hit Shift and restart PC, and you’ll find that option there). I’ve uploaded the Driver File that I used and you can simply download and use when the CHIP shows up as a Composite device instead of showing up as a COM port. The FX570ES is functionally identical to the FX991ES except that the 570ES has a AAA battery whereas the 991ES has button cells. ^ Missing the controller blob! If you followed my earlier tip, notice how I always passed in Image.png as an image file into tesseract to get a text value? This is totally fine if you can source static Image files and make sure they are available at a particular location. However, what if you’re using a live camera that saves a stream of Images? I used mjpg-streamer to live stream images on a web browser and also save them on a Raspberry Pi. ./mjpg_streamer -i "./input_uvc.so -r 640x480 -f 1" -o "./output_http.so -w /usr/local/www" -o "./output_file.so -f /home/pi/Camera_Output -c /usr/bin/mjpg-streamer-overwrite.sh"
Now here’s the challenge: Firstly, tesseract can only take in a defined fileName as an argument and since we’re invoking tesseract from Python, we can’t simply use a script to get the latest file name and pass it as a parameter. I saved this snippet into mjpg-streamer-overwrite.sh which is being invoked on every Image capture as shown earlier. echo -e "Parameter \$1 is:\t\t$1"
echo -e "current directory is:\t\t$(pwd)"
echo -e "move command is:\t\tmv -T -f \"$1\" 'Image.jpg'"
echo -e "move command returned:\t\t$RES"
While building an ALPR (Automatic License Plate Recognition) System on a Raspberry Pi in 2013, I came across tesseract which is a very powerful OCR (Optical Character Recognition) tool. Since my main image capture and trim script was based on Python (triggered from a WebPage), I had to find a way to invoke tesseract from within Python. At first, I looked out for python libraries and wrappers of tesseract and had a hard time getting them to run on the Raspberry Pi. Eventually, I wondered if there was a way to invoke shell commands from Python; and yeah! And at that instance, it hit me to get ideas from use-cases provided by leading IoT Companies such as the Kaa Project (http://www.kaaproject.org/) and many others. I’ve compiled below a list of IoT Project Ideas for your Engineering Projects or IoT use-case demos and have listed them below with links back to the source. You can use these as a starting point and generate your own use cases or directly implement one of these. I’ll try adding in more use cases from other vendors. Happy Making (instead of ready-made buying :P). Ohh, it’s Engineer’s Day today. Happy that. We often come across projects where we’d like to quickly hook up a sensor or an actuator that works on 5V to an Arduino (Uno and others) without using a breadboard. Since the Uno has only one 5V Pin, an easy way to get additional pairs of VCC+GND is to use the ICSP headers available for the Atmega328 and Atmega16U2.